An oldie but a goodie from my first blog, “The Pipes Are Calling” on Medscape. This case came to mind when I recently diagnosed a pheochromacytoma from my clinic -middle aged man with difficult to control hypertension and unilateral renal artery stenosis. One of the most critical lessons learned from medical school, the Columbia University College of Physicians and Surgeons, was to be a complete physician, to be curious and engaged in the well being of your patient even outside the narrow focus of your specialty. This I learned especially from people like Drs. Harold Neu and Mark Hardy. And a “2.2cm peripherally enhancing mass” probably representing a lymph node with central necrosis, adjacent to the aorta. That tumor was out quicker than you could say “snit.” Frozen section, and later final pathology returned paraganglionoma. The patient recovered well and graciously gave permission, as all my patients here do, to allow this to be discussed. He noted that hypertension kept him out of Vietnam. Records showed an uneventful CABG. Applying the retrospectocsope, I will now be far more wary of midline retroperitoneal lesions that are highly vascularizad. Something that I recently promised Dr. James S.T. Yao, I will be working to publish on my stent removal and extended remote endarterectomy cases and techniques. Meanwhile, here is a talk. Leriche Syndrome -one of those disease names that adds to our work in a way that an ICD codes and even the “aortoiliac occlusive disease” fails to describe. When I hear someone described as having Leriche Syndrome, I think about a sad, chain smoking man, unmanned, complaining of legs that cramp up at fifty feet, pulseless. The CT scan will occasionally show an aorta ringed by calcium in the usual places that are targetrs for clamping below and above the level of the renal arteries. Even without the circumferential calcium, a bulky posterior plaque presages the inability to safely clamp the aorta. Woe to the surgeon who blithely clamps a calcified lesion and finds that the rocky fragments have broken the aorta underneath the clamp! The first way to deal with this is to look for ways not to clamp the aorta, by planning an endovascular procedure, but circumstances may necessitate the need to control the aorta despite the unclampability. The traditional methods of avoiding clamping the calcifed peri-renal aorta are extra-anatomic bypasses including femorofemoral bypass and axillo-femoral bypass. I propose these following options for the consideration when the patient needs a more durable solution while avoiding a heavily diseased aorta. EndoABF does work to avoid clamping -these are common femoral endarterectomies supplemented by stenting of the aortoiliac segment, including in those with appropriate anatomy, a bifurcated aortic stent graft. This is often not possible to treat both sides, but one side is usually more accessible. Often, people will compromise and perform an AUI-FEM-FEM, but I have found the fem-fem bypass to be the weak link, as you are drawing flow for the lower half of the body through a diseased external iliac artery. The orientation of the proximal anastomosis is unfavorable and in the instance of highly laminar or organized flow, the bypass is vulnerable to competitive flow on the target leg, leading to thrombosis. The femorofemoral bypass is the option of patients whose options have largely run out. It is made worse when fed by an axillofemoral bypass. Sometimes, you have no choice, but in the more elective circumstance, you do. The second method is performing a aorto-uni-iliac stent graft into a conduit sewn end to end to the common iliac aftery, oversewing the distal iliac bifurcation. The conduit is 12mm in diameter, the key is to deliver the stent graft across the anastomosis, sealing it. The conduit is then sewn to the side of a fem-fem bypass in the pelvis, maintaining antegrade flow to both legs. The other option is to sew the conduit to a 14×7 bifurcated graft. Illustrated above is this 12mm conduit sewn end to end to the diseased common iliac artery with wire access into the aorta and a aorto-uni-iliac device. Typically, a small AUI converter (Cook, Medtronic) can be used, but the aorta is often too small even for a 24mm device, and an iliac limb with a generous sized docking segment (Gore) ending in a 12mm diameter fits nicely. Below is a CTA from such a case, where the stent graft is deployed across the anastomosis, sealing it off from anastomotic leaks (exoleaks). Often, the infrarenal aorta is soft anteriorly and affected only by posterior plaque at the level of the renal arteries. While a clamp is still not entirely safe (I prefer clamping transversely in the same orientation as the plaque with a DeBakey sidewinder clamp), a balloon is possible. I do this by nicking the aorta -simple application of a finger is sufficient to stop the bleeding if you have ever poked the ascending aorta to place cardioplegia line. A Foley catheter is inserted and inflated. The Foley’s are more durable and resist puncture better than a large Fogarty. This is usually sufficient for control, although supraceliac control prior to doing this step is advised. The aorta can be endarterectomized and sewn to the graft quite easily with this non-clamp. This has worked well, Although pictured above with an end-to end anastomosis planned, it works just as well end-to-side. I actually prefer end to side whenever possible because it preserves the occluded native vessels for future intervention in line. The typical board answer for the non-clampable aorta is taking the inflow from the thoracic aorta or from the axillary artery -neither of which are good options. The first because the patient is positioned in right lateral decubitus and tunneling is not trivial. The second because of long term durability. The supraceliac aorta, technically it is the thoracic aorta, is often spared from severe plaque and clampable. Retropancreatic tunelling is straightforward, and a 12 or 14mm straight graft can be tunelled in this fashion from the lesser sac to the infrarenal retroperitoneum. It then sewn to the supraceliac aorta and then anastomosed to a 12x6mm or 14x7mm bifurcated aorto-bifemoral bypass, of which limbs are tunneled to the groins. This worked very well recently, allowing a middle aged patient with severe medical problems, occluded aorta and iliac arteries, with critical limb ischemia, survive with minimal blood loss and home under 5 days. It delivers excellent flow to both legs in an antegrade fashion. Dr. Lew Schwartz gave me a list of references showing that this is not novel, but represents a rediscovery as the papers were published in the 80’s [reference], and buttresses the principle that innovations in open vascular surgery are exceedingly rare, largely because we have been preceeded by smart people. Conclusion: All of these come about through application of some common sense and surgical principles. The most important this is that the aorta is the best inflow source and reconstructing it with the normal forward flow of down each leg and not reversing directions as in a fem-fem bypass gives each of these options a hemodynamic advantage. Surgery [Surgery] 1987 Mar; Vol. 101 (3), pp. 323-8. Texas Heart Institute Journal [Tex Heart Inst J] 1984 Jun; Vol. 11 (2), pp. 188-91. A CT scan was sent with the patient but has been lost to time, and it showed a patent aorto-bifemoral bypass send flow around an occluded distal aorta and iliac arteries. The graft did not have a telltale haze around it nor a dark halo of fluid which signaled to me that it was likely well incorporated and only sick in the exposed part. The patient was not septic, but had grown MRSA from the wound which was granulating from the extensive wound care that had been delivered. 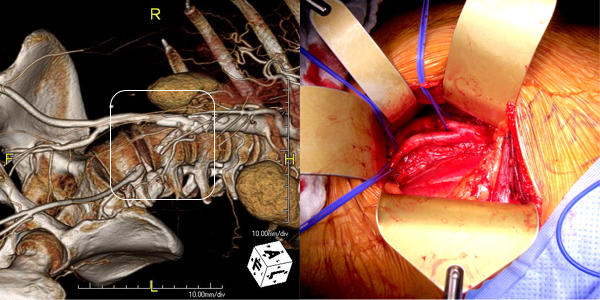 I felt that it would be possible to move his anastomosis point more proximally on the external iliac in a sterile field (figure above), and then close, then endarterectomize the occluded external iliac artery after removing the distal graft, then after vein patching, cover the repair with a sartorius muscle flap. It would salvage the remaining graft and avoid a much larger, more intense operation which was plan B. To prepare for that, I had his deep femoral veins mapped. The patient was prepped and draped, the groin was excluded by placing a lap pad soaked in peroxide/betadine/saline solution (recipe for “brown bubbly” liter saline, a bottle of peroxide, a bottle of betadine), and covering with an adesive drape. The rest of the abdomen was then draped with a second large adhesive drape. A retroperitoneal (transplant-type) right lower quadrant incision was made (below) and the external iliac artery and graft were exposed. As predicted on CT, the graft was well incorporated. 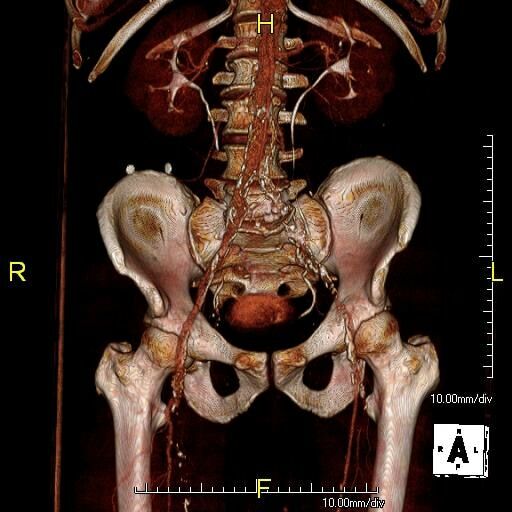 The external iliac artery was opened and focally endarterectomized of occlusive plaque (image below). The adventitia had good quality despite the longstanding occlusion. The graft was mobilized and transected and anastomosed end to side to this segment of artery (below). Dissecting was made difficult by how well incorporated it was. The wound was irrigated (with brown bubbly) and closed, dressed, and sealed over with the adhesive drape. 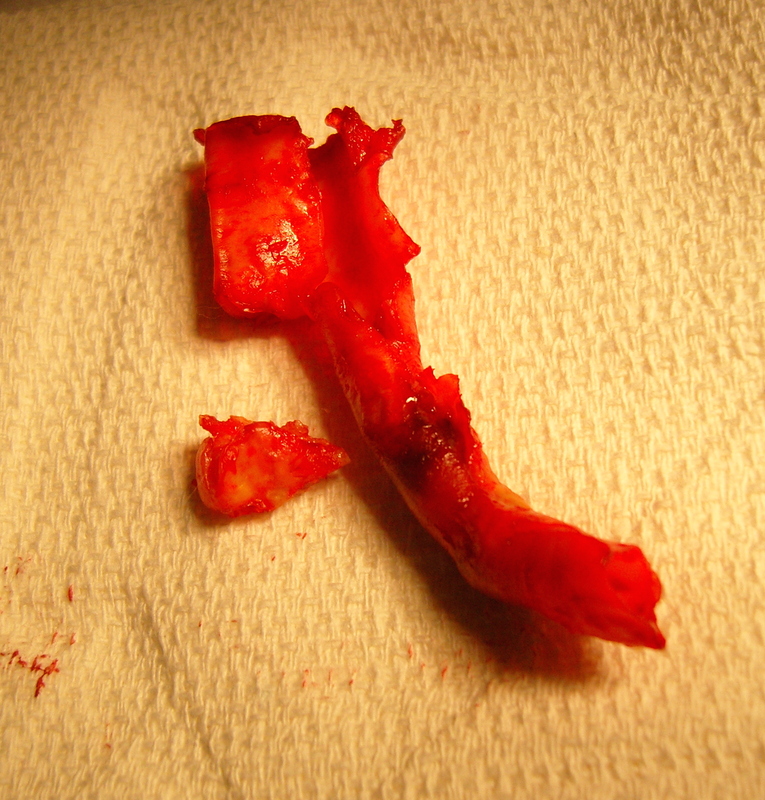 The groin wound was then revealed and the graft pulled out (below). Remote endarterectomy using a Vollmer ring was used -in this case I didn’t use fluoroscopy given the short distance to the terminus of the plaque which i had mobilized in the pelvis. The plaque came out easily and was not infected appearing. It is shown below ex vivo. 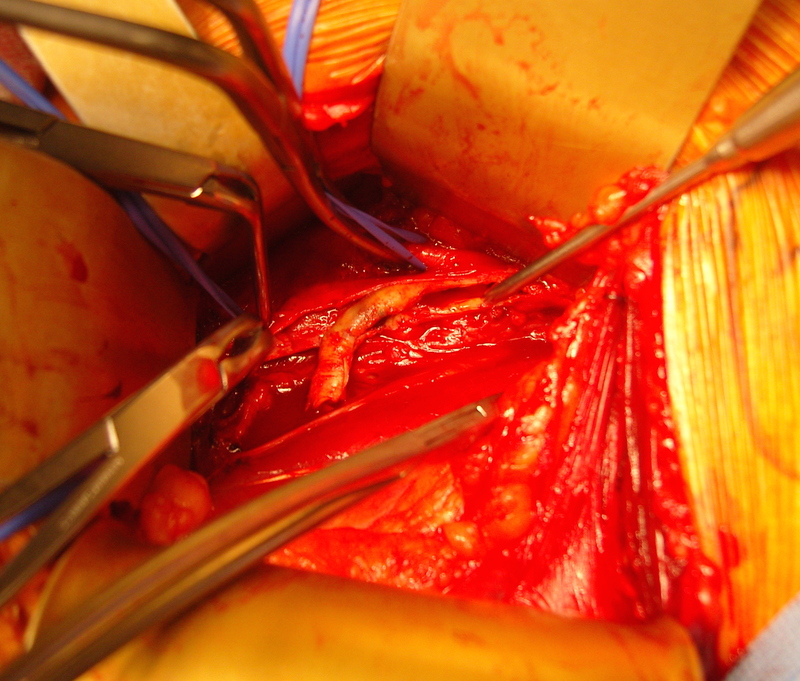 A segment of saphenous vein was harvested from the patient medially and the arteriotomy was patched. The sartorius muscle was mobilized and applied as a flap over this. The wound was irrigated with brown bubbly and packed open with the intention of VAC application. The patient healed very rapidly and remains infection free. I had used this approach on several occasions in the past and twice more recently. It truly is salvage as it preserves the uninfected graft while never exposing it to the infection in the process of operating. It avoids having to remove the whole graft which then damages the left side -I have seen other surgeons take this approach elsewhere taking a all-or-nothing approach to graft infection to considerable morbidity to the patient. It avoids having to harvest deep femoral vein -another large operation to which the body responds truculently. The patient recently came by for his 4 year followup, still smoking, but legs preserved. The patient came back in followup -it has been 4 years since his infection was repaired. He was complaining of short distance claudication. His wound healed well and remains closed. CTA shows along with his short segment SFA occlusion which we will treat, a widely patent R. EIA (below). The chronically occluded EIA can be readily seen. The artery shown in the current CTA is that recanalized artery. The patient is an 70 year old man referred for evaluation of claudication that occurred at under a block of walking. He reported no rest pain or tissue loss. He smoked heavily up to a pack a day, with congestive heart failure with an ejection fraction of 40%, prior history of myocardial infarction treated with PTCA, and pacemaker, and moderate dyspnea on exertion. On examination, patient had a flaccid abdomen through which the AAA could be palpated, and he had no palpable femoral artery pulse bilaterally, nor anything below. He had a cardiac murmur and moderate bilateral edema. Preoperative risk evaluation placed him in the high risk category because of his heart failure, coronary artery disease, and his mild to moderate pulmonary disease. CTA (pictured above and below) showed a 5.1cm infrarenal AAA with an hourglass shaped neck with moderate atherosclerosis in the neck, an occluded left common iliac artery with external iliac artery reconstitution via internal iliac artery collaterals, and a right external iliac artery occlusion with common femoral artery reconstitution. There was calcified right common femoral artery plaque. Treatment options included open surgical aortobifemoral bypass with exclusion of the AAA, total endovascular repair with some form of endo-conduit revascularization of the occluded segments of iliac artery, or a hybrid repair. Open aortic repair in patients with heart failure and moderate COPD can be performed safely (ref 1). Dr. Hollier et al, in the golden age of open repair, reported a 5.7% mortality rate operating on 106 patients with severe category of heart, lung, kidney, or liver disease. Typically, the hybrid repair involves sewing in a conduit to deliver the main body of a bifurcated or unibody stent graft when endovascular access is not possible. Despite techniques to stay minimally invasive -largely by staying retroperitoneal, this is not a benign procedure (ref 2). Nzara et al reviewed 15,082 patients from the NSQIP database breaking out 1% of patients who had conduit or direct puncture access. Matched analyses of comorbidities revealed that patients requiring [conduit or direct access] had higher perioperative mortality (6.8% vs. 2.3%, P = 0.008), cardiac (4.8% vs. 1%, P = 0.004), pulmonary (8.8% vs. 3.4%, P = 0.006), and bleeding complications (10.2% vs. 4.6%, P = 0.016). I chose to perform a right sided common femoral cutdown and from that exposure, perform an iliofemoral remote endarterectomy of the right external iliac to common femoral artery. This in my experience is a well tolerated and highly durable procedure (personal data). Kavanagh et al (ref 3) presented their experience with iliofemoral EndoRE and shared their techniques. This would create the lumenal diameter necessary to pass an 18F sheath to deliver an endograft. I chose the Gore Excluder which would achieve seal in the hourglass shaped neck and allow for future visceral segment intervention if necessary without having a suprarenal stent in the way. I planned on managing the left common iliac artery via a percutaneous recanalization. The patient’s right common femoral artery was exposed in the usual manner. Wire access across the occluded external iliac artery was achieved from a puncture of the common femoral artery. Remote endarterectomy (EndoRE) was performed over a wire from the common femoral artery to the external iliac artery origin (pictures below). The 18F sheath went up with minimal resistance, and the EVAR was performed in the usual manner. 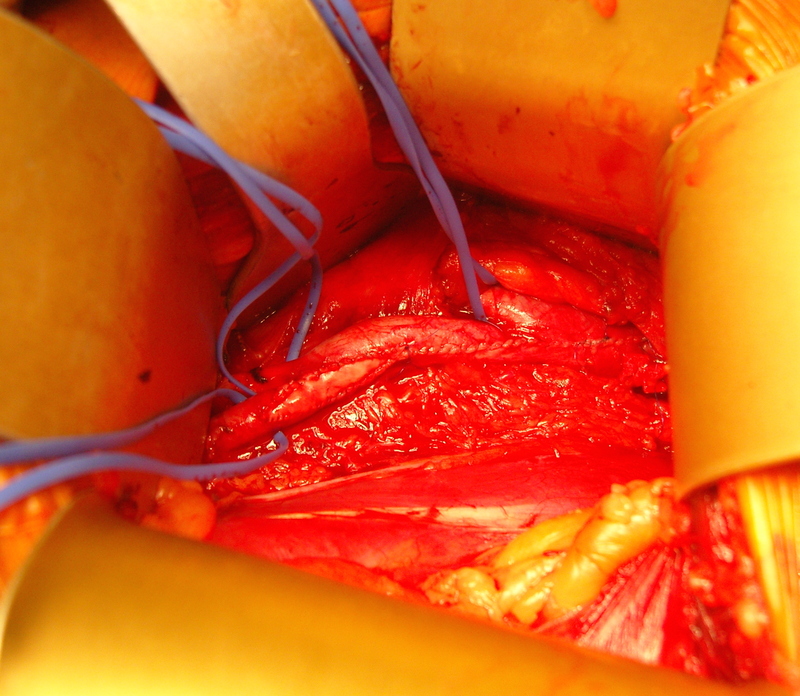 The left common iliac artery occlusion was managed percutaneously from a left brachial access. The stent graft on the left was terminated above the iliac bifurcation and a self expanding stent was used to extend across the iliac bifurcation which had a persistent stenosis after recanalization. The patient recovered well and was sent home several days postprocedure. He returned a month later with healed wounds and palpable peripheral pulses. He no longer had claudication and CTA showed the aneurysm sac to have no endoleak (figures below). Composite imaging showing normal appearing right iliofemoral segment (EIA + CFA) and patent left common iliac artery. I have previously posted on using EndoRE (remote endarterectomy) for both occlusive disease and as an adjunct in EVAR. Iliofemoral EndoRE has excellent patency in the short and midterm, and in my experience has superior patency compared to the femoropopliteal segment where EndoRE is traditionally used. This case illustrates both scenarios. While the common iliac artery occlusions can be expected to have acceptable patencies with percutaneous interventions, the external iliac lesions typically fail when managed percutaneously especially when the stents are extended across the inguinal ligament. The external iliac artery is quite mobile and biologically, in my opinon, behaves much as the popliteal artery and not like the common iliac. Also, the common femoral arterial plaque is contiguous with the external iliac plaque, making in my mind, imperative to clear out all the plaque rather than what can just be seen through a groin exposure. On microscopy, the external iliac artery is restored to a normal patent artery -I have sent arterial biopsies several months after endarterectomy and the artery felt and sewed like a normal artery and had normal structure on pathology. This implies that the external iliac can be restored to a near normal status and patients that are turned down for living related donor transplantation of kidneys can become excellent recipients. In this case, this hybrid approach effectively treated his claudication but also sealed off his moderate sized AAA while not precluding future visceral segment surgery or intervention with a large suprarenal stent. Hollier LH et al. J Vasc Surg 1986; 3:712-7. The patient is a woman in her 60’s who self referred for complaint of abdominal pain, weight loss, and rest pain of the lower extremities. She is a 40 pack year smoker and had severe COPD, hypertension, congestive heart failure with mitral regurgitation, chronic kidney disease stage IV, and ischemic rest pain of the legs. She had a 30 pound weight loss due to severe postprandial abdominal pain. She had bloody stools. Her kidney function was worsening, and dialysis was being planned for likely renal failure but she was against dialysis. She had consulted several regional centers but was felt to be too high risk for surgery and with her refusal of dialysis, would be a high risk for renal failure and death with intervention. Physical examination revealed weakened upper extremity pulses, and nonpalpable lower extremity pulses and a tender abdomen. In clinic, she developed hypoxia and dyspnea and was admitted directly to the ICU. CTA (above) revealed severely calcified atherosclerotic plaque of her visceral segment aorta occluding flow to her mesenteric and renal arteries and to her leg. The right kidney was atrophic. The left kidney had a prior stent which looked crushed. 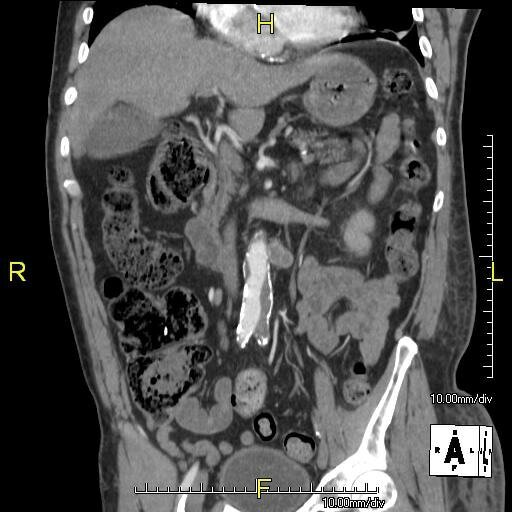 The infrarenal aorta was severely diseased but patent and there were patent aortic and bilateral iliac stents. Echocardiography revealed a normal ejection fraction of 60%, diastolic failure, +2 to+3 mitral regurgitation, and pulmonary artery hypertension. She did respond to diuresis and stabilized in the ICU. Intervention was planned. Options that I considered were an extranatomic bypass to her legs and revascularization from below. I have come across reports of axillo-mesenteric bypass, and I have performed ascending and descending thoracic aorta to distal bypass for severe disease, but concluded, as did the outside centers, that she was a formidable operative risk. Also, there was a high likelihood of great vessel occlusive disease. Looking at her CTA, I felt that she needed just a little improvement in flow -not perfect but good enough. The analogy is like drilling an airline through a cave-in. Also, her left kidney gave a clue -it was normal sized and survived the stress test of a contrast bolus for the CTA without dying. A discussion with the patient green lighted an attempt -she understood the cost of failure but did not wish to linger with this abdominal pain. Access for intervention was via the left brachial artery. Aortography showed the severe stenosis at the origin of the SMA and the nearly occlusive plaque in the visceral segment aorta. The plaque was typical of the coral reef type, and had an eccentric channel that allowed passage of a Glidewire. Access into the left renal artery was achieved. Its stent was patent but proximally and distally there were stenoses; this was treated with a balloon expandable stent. The path to it was opened with a balloon expandable stent to 8 mm from femoral access. This was the improvement the renal needed. A large nitinol stent was placed from this access in the infrarenal aorta when severe disease above the iliac stents was encountered. The SMA was then accessed and treated with a bare metal stent. Her creatinine improved, as did her intestinal angina. She was discharged home. She later returned a month after the procedure with complaints of nausea and vomiting and right lower quadrant abdominal pain and was discovered to have an ischemic stricture of her small bowel. This was removed laparoscopically and she recovered well. She recovered her lost weight and now a year and a half later, remains patent and symptom free. Discussion: Dr. Jack Wiley includes in the preface to his atlas of vascular surgery the words of Dr. Joao Cid Dos Santos, the pioneer of endarterectomy techniques, “Vascular surgery is the surgery of ruins.” And in that context, good enough is sufficient. 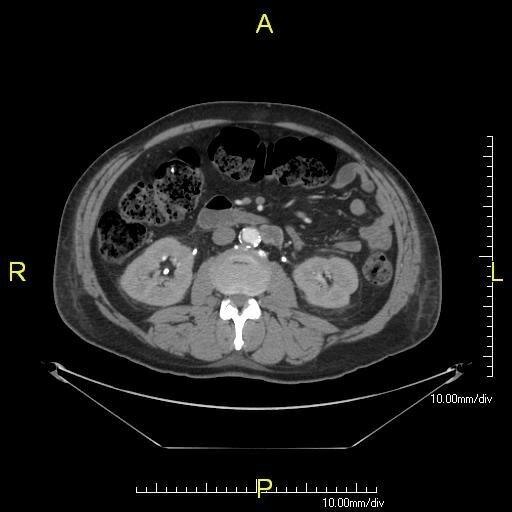 The images above show a patient with on isolated occlusion of his left common iliac artery. He was young, in his forties, but was a heavy smoker and suddenly developed claudication of his left leg which interfered with his work. He quit smoking and did not progress with exercise. Discussion involving possible stenting was made and initially offered but he turned it down because erroneously he assumed that his father’s coronary stents were the same as an iliac stent in terms of longevity. I do think that common iliac and aortoiliac occlusive disease is well treated with stents, but I felt it was possible to do a common iliac endarterectomy. We went over these images together and he settled on proceeding with endarterectomy. The images show how well the 3D Volume Rendering, which I mentally call Virtual Reality, of CTA makes it possible to plan out operations and exposures virtually. The bottom left image shows the surgeon’s eye view of the exposed vessel. Below, the virtual and the actual are juxtaposed. The outline on the virtual image (volume rendered) shows the areas of retraction -for the trainees, the retractor systems work to make quadrilaterals out of linear incisions, and as a rule, the incision should be twice the length of the square that you want to expose. The end points of the endarterectomy were at the aortic and iliac bifurcations. The arteriotomy was repaired with a patch at the iliac bifurcation -the common iliac was large and was repaired primarily. The specimen below was fibrocalcific. The thing about this disease is that the plaque truly has no endpoint -intimal thickening and mild plaque was present that could be taken all the way to the aortic root and to the feet on the other end! This patient did very well and had palpable pulses. He did not develop neointimal hyperplasia and successfully quit smoking. One of the exciting developments is the ongoing development of wearable virtual reality and display solutions -particularly from the gaming industry. The gaming industry ironically drives all computer imaging because that is where the money is at. The advances in imaging trickle down to medicine -the VR images seen here are the result of the same algorithms that drive first person shooting games. It would be great to see this displayed intraop on a HoloLens, on a virtually positioned screen behind the assistant!